The Caron Company - Bank and Trade based RP. Forums » RP Classifieds » The Caron Company - Bank and Trade based RP. The Caron Company is recruiting. Seeking well rounded and self motivated workers for all levels of employment in our various locations. Basic knowledge of numbers and mercantile practices is a must for staff positions. Those of combat prowess may find work as security. 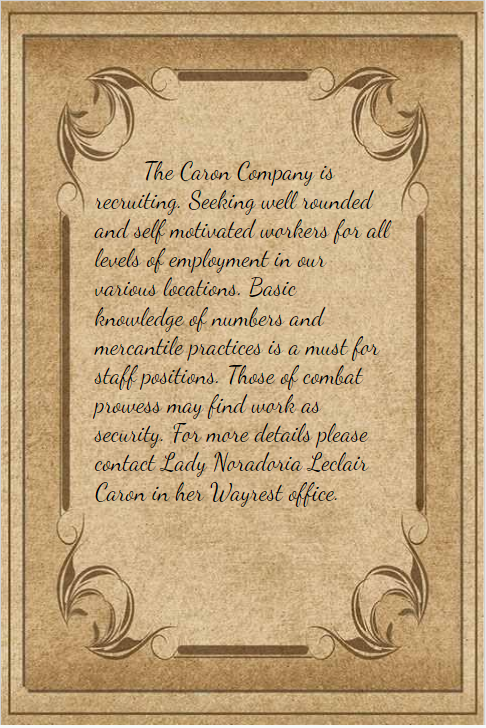 For more details please contact Lady Noradoria Leclair Caron in her Wayrest office. Savings - Deposits and Withdrawals- Overdraft for regular loyal depositors. Credit - Credit limits depend on profession and one's ability to repay. Loans - Business, Personal, Real Estate - Interest rate depends on length of loan repayment. Pawnbroker - Pawn brokerage is available for items of high value with proven ownership. You have a one month limit to regain your valuables or it will be resold. The Company may discuss extensions on an individual basis. Trade - The Caron Company has access to several ships that can be rented for private trade purposes. Any damage done to ship will be repaired at the expense of the renter. Rental of carriages, chariots and wagons has recently been added. As well as horse rentals through our partnership with House Sebai. Horse Breeds can be found here. Merchants - The Caron Company merchants can be found in all branches willing to assist in the reselling of goods purchased through our other branches. Items are transferred to other branches regularly to rotate items to a wider customer base. Storage - Items can be stored in a Caron Company vault for a monthly fee that will be discussed based on the size and requirements for storage. The Caron Company is not a guild, simply myself and some NPC's at the moment. However after having friends allow me to open banks in their areas, I thought it would be fun to reach out and try to meet other people who are interested in trade and merchant based role play. Seeking staff and guards to fit the above mentioned jobs. While the Caron Company works in the services above if your character specializes in something else you feel may fit in some other way please feel free to reach out. Yes, for those interested, there is likely even work to be found for the shadier individual. I have one house I am using as a stand in for one of three locations though I will add more and hope to take part in open world events, eventually. Reach out to me here or in game @D20Ga1 or on Discord @D20gal#6520 or just send me a message here on enjin! We are pleased to be adding to our rental services carriages, chariots and wagons. As well as horses breed by House Sebai. As with other rental services prices will depend on items required and the length of time they are needed.